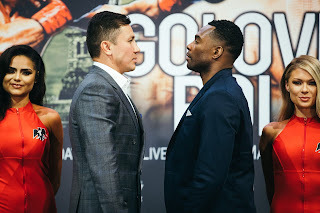 The official weigh-in for Saturday’s pay-per-view showdown for the Unified Middleweight world championship between undefeated IBO/WBA/IBF/WBC world champion Gennady Golovkin and former two-division world champion Saul “Canelo” Alvarez took place earlier today in Las Vegas, NV. The official weights for the entire card are as follows. Main Event: IBO/WBA/IBF/WBC Middleweight world championship – 12Rds. Gennady Golovkin (Champion) 160lbs. vs. Saul Alvarez (Challenger) 160lbs. North American Boxing Federation (NABF) Jr. Featherweight championship – 10Rds. Randy Caballero (Champion) 121lbs. vs. Diego De La Hoya (Challenger) 122lbs. Ryan Martin (Champion) 135lbs. vs. Francisco Rojo 135 1/2lbs. Joseph Diaz 126lbs. vs. Rafael Rivera 127lbs. Serhii Bohachuk 150lbs. vs. Joan Jose Valenzuela 154 1/2lbs. Vergil Ortiz 140lbs. vs. Cesar Valenzuela 140lbs. Marlen Esparza 111 1/2lbs. vs. Aracely Palacios 110lbs. Women’s Jr. Bantamweight – 4Rds. Alexandra Vlajk 114 1/2lbs. vs. Nicola Adams 115lbs. Golovkin vs. Alvarez takes place tomorrow night (Saturday, September 16th) at the T-Mobile Arena in Las Vegas, NV. The fight card can be seen in the United States and Canada beginning at 8PM ET/5PM PT on cable and satellite providers on a pay-per-view basis on HBO Pay-Per-View as well as www.Fite.TV for $79.95. Contact your cable/satellite provider or visit www.Fite.TV for ordering information. For more information on HBO Sports, HBO Boxing, and HBO Pay-Per-View please visit: www.hbo.com/boxing. In the United Kingdom and Ireland, the fight card can be seen on a pay-per-view basis on BoxNation Box Office beginning at 1AM (Sunday, September 17th Local UK Time) for €21.95 HD/ €16.95 Standard Definition. (Fight card will be included at no extra cost for existing BoxNation subscribers as part of their subscription.) For more information about BoxNation and to order Golovkin-Alvarez please visit: www.boxnation.com.